After a long wait, in which many of its competitors have overtaken it, WhatsApp has finally released its application to chat on the web. Therefore, we can now use WhatsApp from any computer regardless of your operating system, or at least so it should have been. The only browser that the application is compatible is Chrome. iOS users will not be able to use this web application, and this is something which does not seem that will change soon. 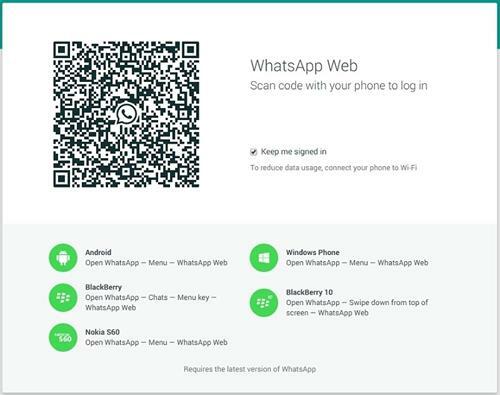 When we access the WhatsApp Web page, it will show us a QR code to which we will have to sign with the camera of your mobile phone using the option "WhatsApp Web" implemented in the mobile application after its last update. Once this is done, the web is synchronized automatically with our device via WiFi or our data connection. The connection to the servers of WhatsApp is not performed from the web page, but directly from the mobile phone that we have paired with it. In this way, all conversations and images that we treat are downloaded from the server and uploaded to the web directly from our mobile phone, and if this fails we cannot use the service. This indicates that what the web WhatsApp offers is not an instant messaging client in the cloud such as the offering from big competitors like Telegram, but a shortcut to our mobile phone application, and depends upon it at all times to work. Time will tell if this decision has been successful or if they have lost an opportunity at the height of what the competition offers. During my testing, I have seen that this web application is limited. We can send and receive text, voice and image messages, but it does not include other key features like sending video files or share contacts and our location. Consider this that the actual connection is made via our mobile phone only so it should not have been very complicated to implement. The interface is quite similar to that of the mobile application, showing on the left column list of our conversations and on the right the contents of these. Navigating the contacts column I have realized that there are many features to be included in the web version. Our profile cannot be started and I have not found a way to create conversation groups. If we add a new contact on mobile phone while we have the web app open, when trying to open a new conversation with that person from web, it does not appear in the list. So we will have to launch it from your mobile phone or have to restart your browser. If we chose to start the conversation from the phone, data from this contact such as the name or avatar will not appear until you restart Chrome. There are too less options related to conversations too like the possibility to change the background image, see the files that we have shared in conversation, search for specific words in the log, empty the conversation window or the possibility of blocking the user with whom we are communicating. Fortunately, the functions that it includes in the web application do not give any problem. Notifications are displayed perfectly on the PC, messages arrive in real time and the pictures and audio are shared without any problem. In fact, we can even enlarge images. We can see if someone is typing something and the famous double blue check mark for the messages that are read. The fact that iOS users may not use this service, has to do with the way in which Apple's mobile operating system handles applications in the background, since it does not allow nor be able to keep a connection open to a server nor accept incoming connections from the browser. In this way, the only way that the current WhatsApp Web application could run on iOS would be that Apple decided to change the way in which iOS handles your applications in the background. It is quite difficult that it will change anything for a single application, so it does not seem that Apple mobile users will be able to use this website in short or medium term. Why it is only compatible with Chrome? The reason why at the moment Google Chrome is the only browser compatible with WhatsApp Web is simple, at the moment Chrome supports WebRTC better than other browsers. WebRTC is a standard developed by the World Wide Consortium so that browsers are capable of maintaining communications in real-time, something vital for WhatsApp to work correctly. Fortunately this problem, if it appears that could be solved in the medium term. And I think that WhatsApp will lift the blockades to other browsers as they improve their implementation of WebRTC, and therefore ensuring that you may use the web application without any kind of problem. 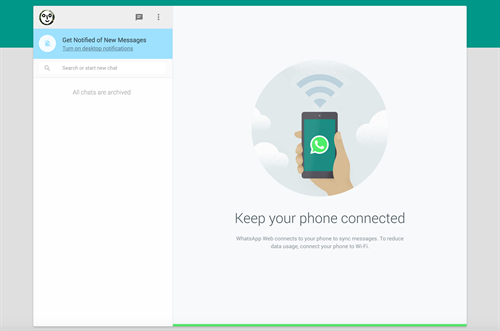 Though it is really a good initiative from WhatsApp, the Web client suffers a lot and has too many limitations. The most important being the need to keep your phone connected to Internet which could be too troublesome for those on limited data plans. Anyhow, a good step in the right direction - let us just hope that they will come up with fixes soon.